We looked at the top 1 Alarm Clocks and dug through the reviews from 1 of the most popular review sites including BestReviews and more. Through this analysis, we've determined the best Alarm Clock you should buy. 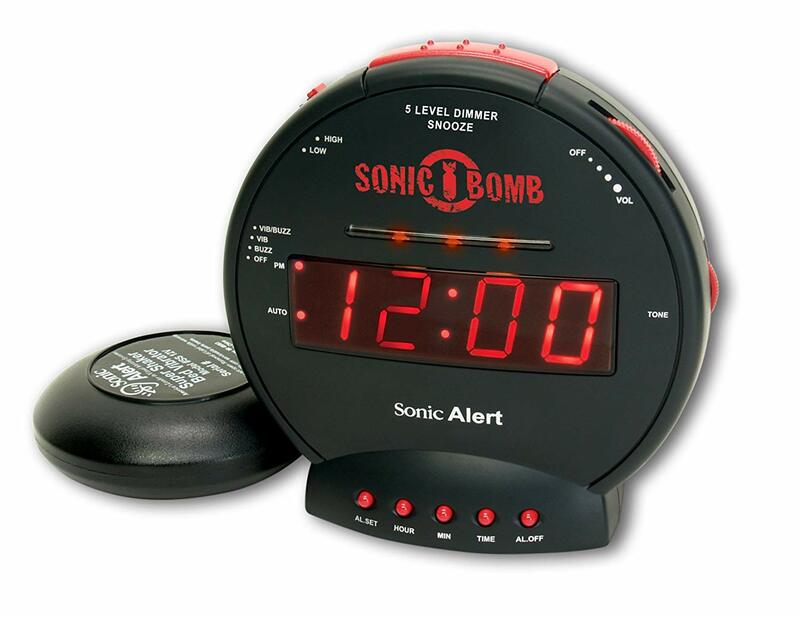 In our analysis of 63 expert reviews, the Sonic Alert Sonic Alert Travel Alarm Clock placed 5th when we looked at the top 10 products in the category. For the full ranking, see below. Checkout The Best Alarm Clock for a detailed review of all the top alarm clocks. Might just scare the heck out of you. Battery backup but alarm wont function if power is out. The Sonic Boom SB200ss has been designed as a cost effective travel& bedside alarm clock, with a large easy to read display and bedshaker, It also is equipped with Dual Power & Dual Time features it comes with a 110 volt power supply, will work with220 volt transformers. Clock also has two switches one allowing user toswitch from 50Hz 110 volts to 60Hz 220 volts. This feature keeps propertime with 110 or 220 volts. Another switch allows you to select 12/24hour time. Dual power capability 110 & 220 volts & 12/24 hour time. Complete with a hi/low dimmer switch to sleep better at night. Packaged with our newest most powerful 12-volt bed shaker. Complete with a loud 113db adjustable tone & volume control. Battery backup to maintain the proper time in the event of a power outage. Waking up is never easy, especially if you don’t get to do it on your own. Alarm clocks have been used for more than a century for pulling people out of a deep slumber, evolving in sophistication along the way. Many people today use a smartphone to wake up, but there are still benefits to an alarm clock. It frees you from the burden of having your smartphone next to you as you sleep, for one, while also giving you a wider range of options as to how you’ll be awoken. If it’s been a while since you’ve gone alarm clock shopping, you may be surprised to hear about the many options now available. 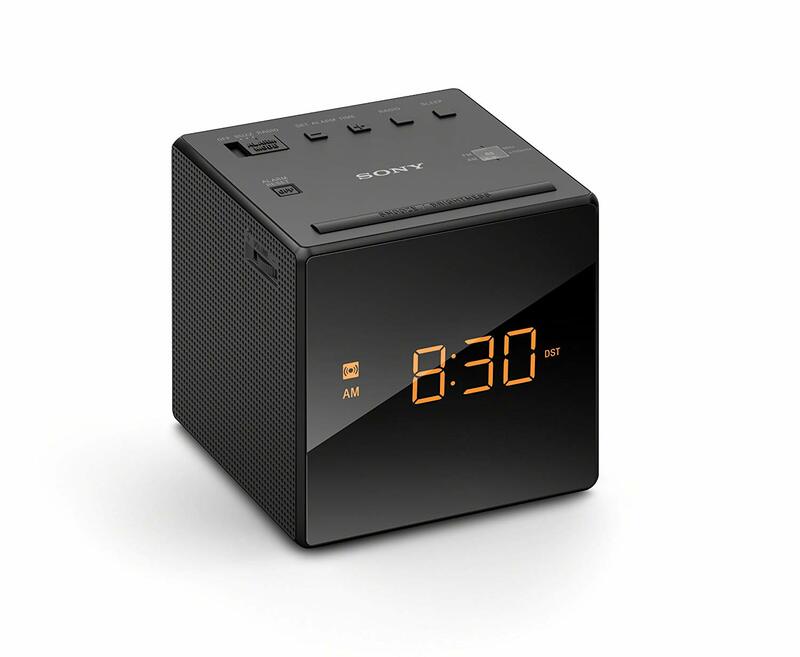 You can still get the standard digital alarm clock that lets you choose between disruptive beeps and other noises versus waking up to a local radio station. But there are also alarm clocks that sync to your phone, letting you wake up to music from your playlist. There’s another option that you may have missed along the way. The Philips Wake-Up Light Alarm Clock uses light therapy techniques to wake you up gently and naturally. It simulates the natural light from the sunrise, working with your body’s circadian rhythms to gently nudge you awake. Even some digital clocks use changing colors as a wake-up technique to combine this new approach with traditional alarm clock design. One thing to consider is the ease of use of your alarm clock. You’ll likely want a digital readout that you can decipher when you roll over in the middle of the night, but you also don’t want it to be so bright that it lights up your entire room. If you’ve ever struggled to set the time or change your wake-up alarm time, you likely know the importance of ease of use. It’s important to consider that feature when you’re shopping, especially if you wake up at different times every day. The need to wake up at a designated time predates alarm clocks. In ancient Greek and ancient Egypt, sundials and obelisks were used to tell time, but that didn’t help with the need to rise and shine. In ancient China, timers in the form of candle clocks were used for the purpose. A candle clock combined wax and nails, with the nails hitting a metal plate once the wax melted beyond a certain point. The noise served to wake up nearby sleepers. In 725, an engineer in China came up with something known as the “water clock,” which used a water wheel and gears to set off gongs at specific times. 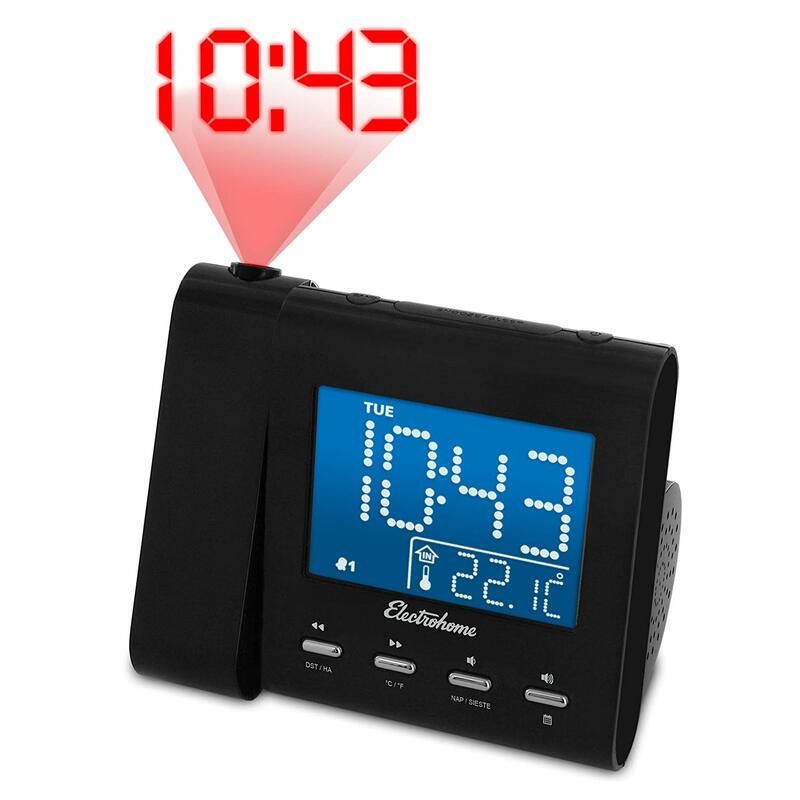 For visually challenged consumers, the American Lifetime Digital Alarm Clock stands out above all others. Not only is its display the easiest to read, but it also gives you details you can use after waking up, including the day of the week and whether it’s morning, afternoon, night or evening. If you want to use it for reminders, it even offers an alert that reminds you when it’s time to take your medicine. The information on the screen on the American Lifetime Digital Alarm Clock is clear from every angle. If you’re looking for something simple and straightforward, consider the RCA Digital Alarm Clock, which is small but features the numbers prominently enough for you to make them out even in your sleepiest state. Brightness preferences can vary dramatically from one person to the next. The RCA Digital Alarm Clock has a high/low brightness control that lets you find exactly the level of light you want your clock to put out. The iHome Bluetooth Color Changing Dual also has that feature, but the minimum brightness still may put out too much light for some. There’s an alarm clock for every budget, from the RCA Digital Alarm Clock, which retails for less than $20, to the Philips Wake-Up Light Alarm Clock, which tops $100. Between those extremes are the American Lifetime Digital Alarm Clock and iHome Bluetooth Color Changing Dual, which each sell for less than $50. Simple designs also mean easier operation. The RCA Digital Alarm Clock has easy-to-use buttons and a full-width snooze buttons for those mornings when you just can’t get going. The only downside to this alarm is that the minute and hour buttons go in only one direction, so you’ll often find you have to run the full cycle to get to the desired time. Although it sounds complicated, setting the Philips Wake-Up Light Alarm Clock is surprisingly easy. You simply choose the wake-up time and select from one of five wake-up sounds. You can also customize the light to the intensity that works best for you. Thirty minutes before your scheduled wake-up time, the simulated sunrise will begin, reaching full intensity at the end of that time period. Morning isn’t the only time your Philips Wake-Up Light Alarm Clock will help you. Use it as a bedside lamp to read at bedtime each night. As it gets closer to your preferred bedtime, the lamp will dim slowly to gradually ease you into sleep. The iHome Bluetooth Color Changing Dual has a unique round design with five different light-emitting colors that you can change at the touch of a button. In a dimly lit room, the chosen color can set a mood. If you want to be able to wake up to FM radio, you’ll need to choose between the Philips Wake-Up Light Alarm Clock or the iHome Bluetooth Color Changing Dual. The iHome Bluetooth Color Changing Dual has the best sound, as well as strong FM reception. If you want to wake up to your own music, the iHome Bluetooth Color Changing Dual is the best choice. You’ll get Bluetooth connectivity that will allow you to stream music from your smartphone. The built-in speakers will make the songs on your phone, mp3 player or tablet sound great. If the power dies overnight, what will happen to your alarm the following morning? With a battery backup, you’ll be covered no matter what. The American Lifetime Digital Alarm Clock, RCA Digital Alarm Clock, Philips Wake-Up Light Alarm Clock and iHome Bluetooth Color Changing Dual all have battery backups. With the Philips Wake-Up Light Alarm Clock, you’ll get backup for up to eight hours after a power failure. The RCA Digital Alarm Clock’s backup uses a 9-volt battery that isn’t included.